Part of Ian’s passion is to bring world class musicians—leaders in their field—to his piping schools. 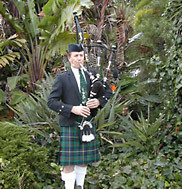 “A Week In Paradise School of Bagpipes” is held annually each summer in Southern California and also features prized guest instructors at the school. See the flier for details. Ian's "Weekend in Paradise Bagpipe School" will be held July 16-20, 2018! "This school provided a minimum of a year's worth of world-class instruction on piobaireachd playing as well as Ceol Beag. I have been playing the pipes for 20 years and have competed as a soloist for 19 years. I have also attended other piping schools. I have found that it is rare to find instruction that is applicable to one's entire style and repertoire. However, this school provided just that type of instruction! I have been able to apply the principles taught at the school to not only the myriad of tunes that were taught at the school, but also to all of my preexisting tunes as well as new ones. I now have the knowledge and skills to approach any type of tune with confidence using a pragmatic, consistent approach that is relatively easy to apply. In my opinion this is a combination of teaching/learning goals that is very difficult to achieve; especially in a one-week course. Mr. Whitelaw and Mr. Henderson achieved it with their expertise, patience, and ability to explain music theory, Scottish piping idiom, piobaireachd interpretation, as well as one's overall approach to tune-learning and practicing. And of course, everyone in the course walked away from it with a professionally set-up set of pipes with other-worldy tone. Big stuff.